The Center of intelligence associated with the Belly allows us to live life on planet Earth. It’s the Center we must call on to act in the world, to move and flow with life and to realize our goals. It’s also the home of our instincts and our ability to connect with our bodies and the world at large. In Buddhism, it is honored as our source of will, intuition and intention. In Qigong, it’s our source of vitality, confidence and willpower. In the West, researchers are now looking at the enteric nervous system (located in the abdomen) as a “second brain.” The reason they’ve termed it thus is twofold: it’s a mass of nerves that is nearly as complex as the brain (too complex to have evolved simply to oversee digestion); it’s also responsible for a large amount of emotional regulation in the production of serotonin, endorphin and other peptides. This validates what Enneagram and other spiritual teachers have been saying all along: our emotions don’t originate in the Heart, but rather in the Belly. Once they reach the Heart, they’ve already become projections, mental constructs, thinking and feeling about our emotions in order to avoid truly feeling them. Tuning into and being fully present in the Belly allows us to work with our emotions when they’re at their most pure and primal, prior to the potential distortion that can happen once they rise into the upper Centers. Another misconception regarding the Belly deals with the way we connect with one another. 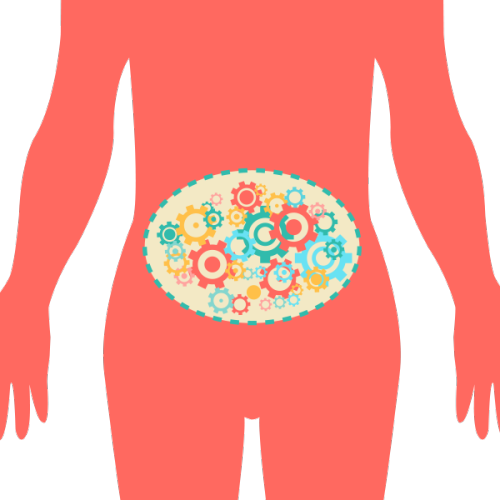 We’ve said that the Belly is the Center through which we connect with the world; that includes our interpersonal relationships. We tend to think that these connections happen in the Heart, but without the support of the Belly, Heart-only connections are superficial. Have you ever wondered why it is that we can have a relationship where we’re really in sync with each other, we feel we get the other and they get us, but then something happens and we all of a sudden realize that we don’t truly know the other and they don’t truly know us? That is the pattern of a Heart-only connection that hasn’t been grounded in the Belly. In the awakened Belly, we find a radical presence, a sense of “I am here” that is unshakable and gives us profound grounding and courage. When we tune into the support of the Belly Center, our connections with everyone and everything become richer, fuller, more integral. Peter Wilber calls these connections “umbilical.” This is because the Belly is the ground of our Being. When we cut the Belly out of the process, we lose touch with our fundamental ground, the source of our self-ness and our true nature. The Heart and Head can ruminate and be “out to lunch” in the past or future, but only the Belly Center can connect us with the here and now. Russ Hudson says that you are only present to the degree to which you’re in tune with the sensations of the body. This is why many meditation practices direct us to tune into the breath or bodily sensation. When the Belly Center is balanced and healthy, its Essential qualities express themselves through us effortlessly. Some of the Essential qualities of the Belly Center are groundedness, confidence, vulnerability, immediacy, vitality, connection, engagement, wholeness and strength. Because the Belly is what gets us here, the primary issue of the Belly Center is that of survival vs. annihilation and our right to be here. However, through the process of ego-splitting, we lose connection with our Belly Center. We lose our grounded trust that we have a right to be here and therefore others and the world at large begin to seem like they’re trying to infringe on us. We become very concerned about our autonomy and we want to affect our environment, but don’t want to be affected by it. When we’re not feeling particularly well-grounded in a deep, abiding trust in our right to be here, Ego steps into the void attempting to “fake it till we make it” with bodily tension, resistance, control, aggression and repression. 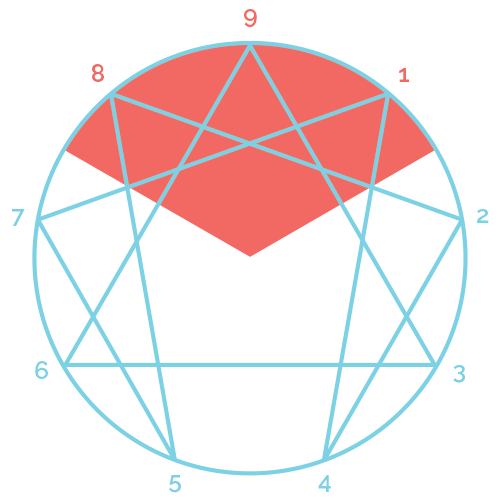 The types in the Belly Triad reside at the top of the Enneagram and include types Eight, Nine and One. These types are looking for autonomy, and the primary affect is anger or rage which is the natural response of Belly energy when we perceive that our autonomy or our right to be here is being messed with. We must note here that these types are not the only ones that experience the issues of the Belly Triad. They’re simply the types whose egos are structured around the reactivity that results from a disruption in the experience of fully connecting with the Belly. The Eight over-expresses Belly energy in an act of ego expansion. They figuratively (and sometimes literally) draw a line in the sand around themselves and anything that falls into the “mine” category and dare others to cross that line at their peril. The reason this happens is because the Eight has lost that abiding trust in their right to be here and this loss is experienced as something awful was done to them and they feel violated. There is a sense of betrayal and lost innocence. Ego then constellates around the desire to never, ever let that happen again. Depending on the Level of Development, Eights can subscribe to the idea that a good offense makes the best defense. In other words, they take an adversarial stance toward life and feel their sense of self most supported when they’re moving against someone or something. The One under-expresses Belly energy in an attempt to maintain their integrity because, through the process of ego-splitting, Ones got the message that they lost that grounded trust in their right to be here because they weren’t “good enough.” The wild and primal nature of Belly energy is seen as a threat to that integrity and therefore Ones repress and deny its expression in their lives. It’s a lot like what happens with a pressure cooker. The more they repress this energy, the more it backs up and builds pressure in the system which inevitably leads to some sort of release. The healthier Ones are, the more comfortable they become with their own Belly energy and the more likely they are to express it in healthy ways. However, the less healthy they are, the more likely this energy is to be expressed in unhealthy ways that the One either justifies or refuses to be conscious of. The Nine is the most disconnected from the Belly Center and they both over- and under-express the energy: they are also uncomfortable with the wild, primal nature of their own Belly energy because they fear it threatens their all-important peace of mind and they therefore repress it, but they also exert this energy outward to maintain their autonomy. Nines interpret their loss of groundedness as evidence that they don’t really exist. They feel vague, and often exist in a dreamlike state where everything is kept in soft-focus in an attempt to keep anything upsetting from disturbing their peace of mind. One of our teachers, Brian Grodner, put it best: “Nines feel like they don’t have a full membership to Club Universe.” They feel like they don’t fully exist because they’ve lost connection with the empowering Belly center, however, they’re actually quite energetic and powerful, it’s just that they expend all that energy trying to maintain the ego’s version of peace and balance.